Chekhov’s Cherry Orchard blooms in a Camden pub while his Three Sisters take the stage in Euston. If you missed the autumnal flurry of London Chekhovs, don’t despair – Three Sisters has arrived at the New Diorama Theatre near Euston and an intimate production of the Cherry Orchard has opened in Camden at the Theatre Collection. The Cherry Orchard was first staged in 1904, when Russia was struggling with the brand-new twentieth century and the serfs had been free for less than 50 years. The Theatre Collection’s new production roots the play in its original setting. The period costumes and slightly stilted translation are a world away from the radical rewritings of some recent versions, but Chekhov’s themes and psychological observations are timeless. The Cherry Orchard has provoked debate ever since it was written. Chekhov saw it as a comedy, but Konstantin Stanislavsky, its first director, brought out its tragic elements. The rich merchant Lopakhin, who eventually buys the orchard where his father worked as a serf, has often been played as a villain, but his character has a typically Chekhovian complexity. Frustrated by the family’s inactivity, he is torn between love, impatience and ambition. Emma Francis as Ranevskaya and Alex Harland, playing Lopakhin, admirably convey Chekhov’s moral ambivalence. He gazes at her with obsessive longing while she, elegantly turned out in a series of different costumes, dismisses him with a disdain that borders on disgust. When she needs attention, however, she manipulates his infatuation, calling him back so she can confide in him. The emotional equilibrium and the balance of power shift as the play progresses, until Ranevskaya weeps over her lost, blossoming childhood and Lopakhin dances with maniacal glee as he anticipates cutting down the trees. The moment when she takes her brother’s hand and says goodbye to the old house is poignant. Some of the other acting is more erratic, but Lucien Morgan’s amiable Gaev contributes a welcome vein of comedy, feeding vodka to his duck-handled walking stick and making it quack at his nieces as they tell him to talk less. Danielle Hog as Dunyasha is lively and flirtatious, while Helen Foster gives a moving interpretation of the strange and lonely German governess, Charlotta. Foster’s magic tricks are real, and she sings hauntingly in Russian about having no family (“nye rodnya”). Her monologue at the start of the second act underlines the play’s profound and unanswered questions about the nature of identity: “Where I come from and who I am I don’t know”. The other outstanding performance among the minor characters is Nick Simons in the role of Firs. The ancient servant, embodying the spirit of outmoded feudalism, fusses around his master with blankets, urging him to dress more warmly. Simons’ portrayal of age, dedication and failing health is disarmingly convincing. Before they leave, the household observes the Russian tradition of sitting in silence, their frozen faces mourning the past or excited about the future. The Theatre Collection is the latest incarnation in Victor Sobchak’s unstoppable series of companies. Sobchak, a prolific director, actor and writer, started his theatrical career with controversial 1980s experiments in the Soviet Union, leading to an accusation of “religious propaganda” by the authorities and a period in a Siberian mental hospital. Arriving in London in 1995, he has been bringing Russian drama to British audiences ever since; Tolstoy, Dostoevsky, Nabokov, Gogol and others, as well as Chekhov, have squeezed onto the tiny stage above the Lord Stanley pub. The repertoire has even included an adaptation of a novel by the popular sci-fi writer, Victor Pelevin. 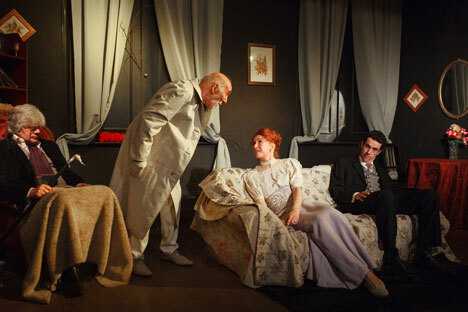 Meanwhile, the talented, young actors of the Faction Theatre ensemble have included Chekhov in their spring repertory season for the first time at the Diorama Theatre in Euston. More polished and professional than the raw immediacy of pub theatre, their no-frills, darkly comic Three Sisters gets to the heart of this bleak, existentialist drama in which the Prozorov sisters long to escape their boredom in a small rural town to start a new life in Moscow. The props are made of brown paper, the set from mismatched chairs, painstakingly lugged on stage by Anna-Maria Nabirye playing the old servant Anfisa (a nice contrast with the other characters who talk about work while she does it). The costumes are nondescript-modern, throwing the focus onto the acting. Between the scenes, loud ticking and the shipping forecast waltz, Sailing By, accentuate the theme of the inexorable passing of time. There are several memorable performances, like Kate Sawyer’s big-sisterly, school-marmy Olga and Laura Freeman’s brilliantly uncomfortable, nouveau riche Natasha. It’s sometimes hard to get really involved; updating the play (the samovar has become a kettle, Andrei feels “decidedly woozy”) makes the constraints on the sisters less clear, but there are many fine moments of emotional tension and charm. These may not be the most sophisticated productions of Chekhov’s plays, but they both have an energy that illuminates the playwright’s words. Young directors like the Faction’s Mark Leipacher and Theatre Collection’s Shaban Arifi are impressively dedicated. These smaller, more affordable venues are, in their different ways, vibrant centres of creative endeavour that deserve support in these fast-changing times. You can see The Cherry Orchard at the Theatre Collection until February 17th. Tickets are £12.